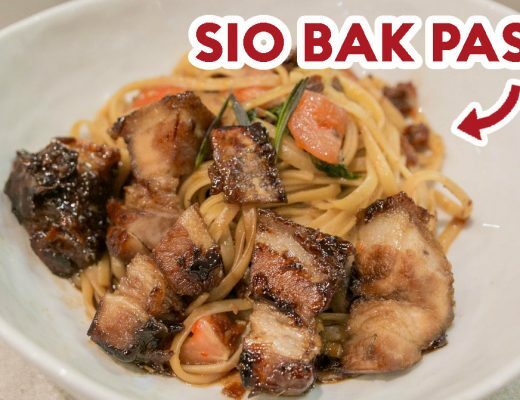 It’s almost impossible to count the number of times I’ve had BBQ, be it Korean BBQ, Mookata or BBQ under a friend’s condo, but it was only recently that I came across Vietnamese BBQ in Singapore. 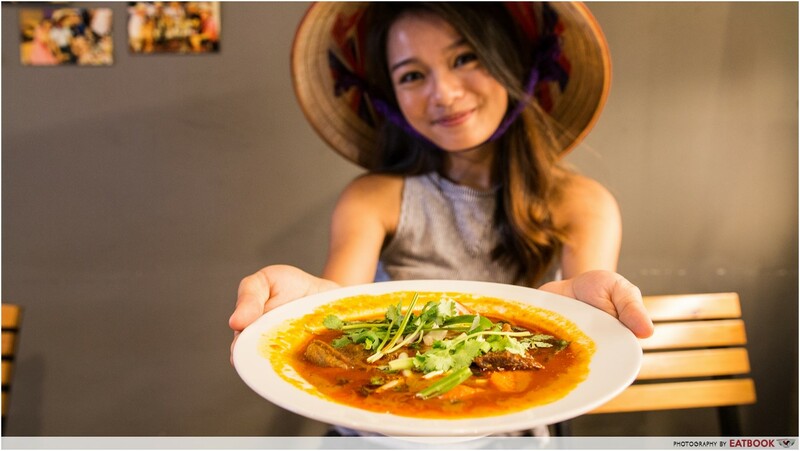 Not gonna lie, the only thing that used to pop up in my head when I think of Vietnamese cuisine is pho and banh mi, so I was intrigued when I chanced upon Lang Nuong at Jalan Besar. 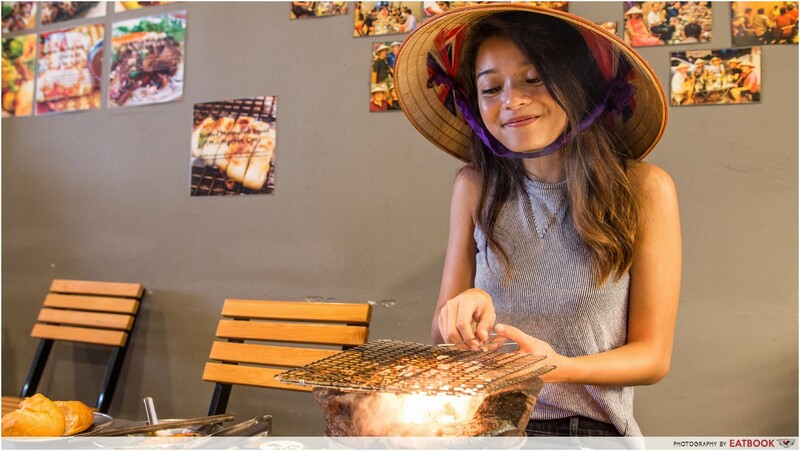 Situated along Foch Road, Lang Nuong, which means “Vietnamese BBQ” or “Grill Village”, gives Singaporeans a whole new BBQ experience. As soon as we sat down, I ordered Lang Nuong’s Vietnamese BBQ. I chose BBQ Platter for two ($39.90+) and couldn’t resist ordering one of their Vietnamese dishes, Bo Kho Banh Mi ($6.90+), or beef stew with Vietnamese baguette. 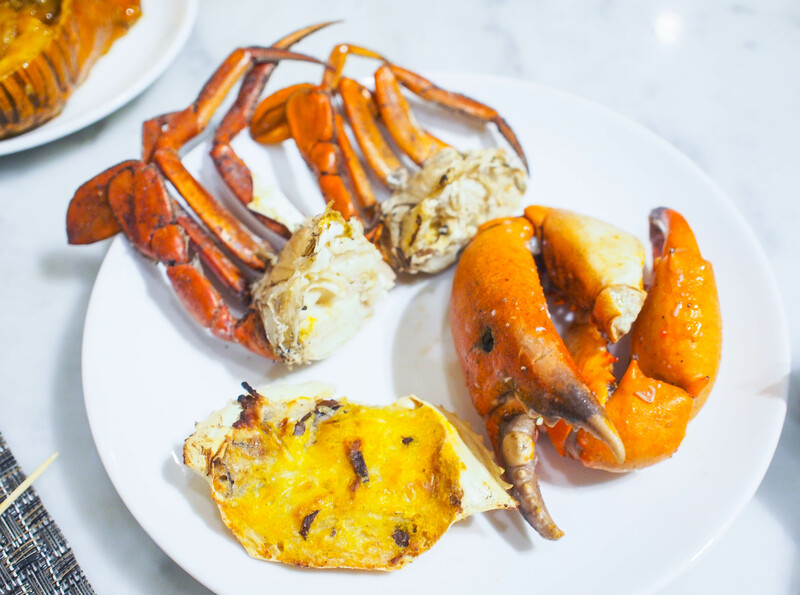 For $39.90, I was happy to find a huge platter of seafood and meat served! There was a mix of fresh prawns, squid, chicken thigh, pork belly and pork collar. I was told they are all marinated in a range of homemade Vietnamese sauces. 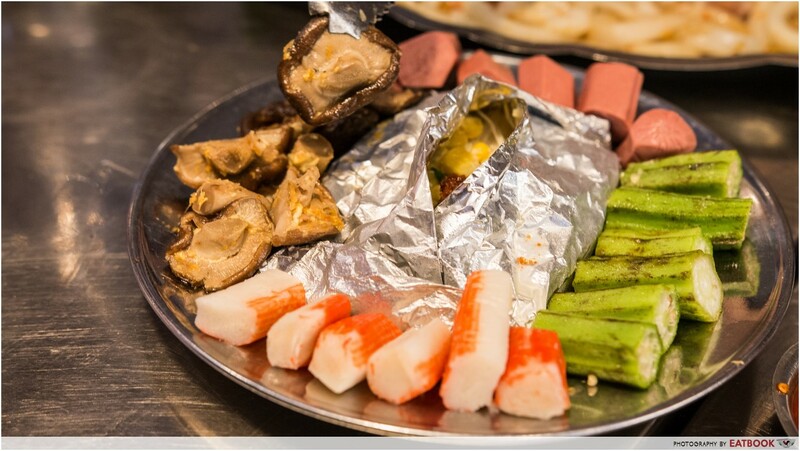 Besides the glorious plate of proteins, there was also a plate of veggies that included lady’s fingers, crab sticks, sausages, shiitake mushrooms and enoki mushrooms. A makeshift BBQ pit comprising of a claypot full of charcoal and a metal grill was also set up on our table. 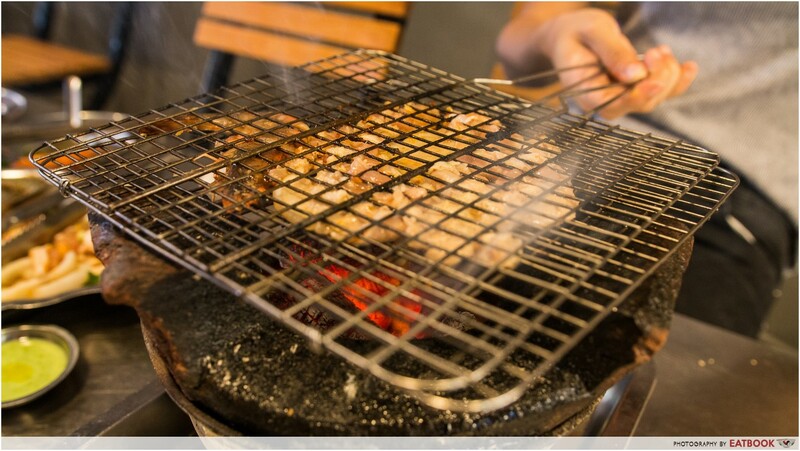 Grilled over charcoal fire in an old-school claypot, the meat was cooked slower than at Mookata or Korean BBQ restaurants. I’d usually advise hangry souls to head somewhere else to tame the monster, but not this time ’cause the food here is truly worth the wait. Yes, even if hunger threatens to tear your tummy apart. 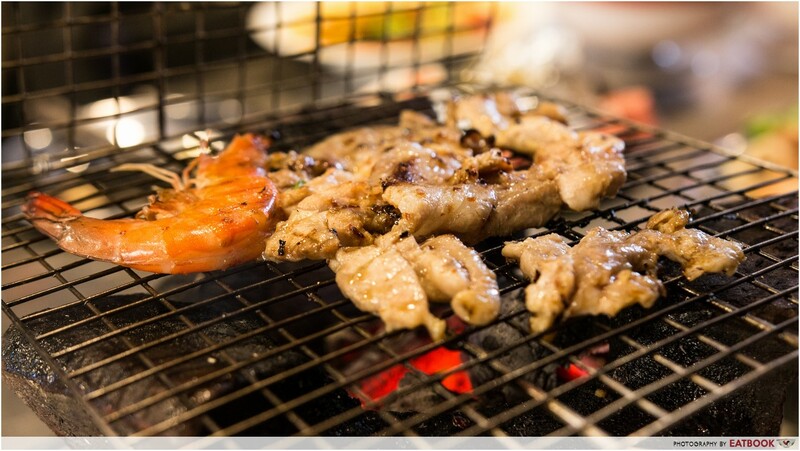 A foldable metal grill with handles is used here, so you can kiap your ingredients in-between and flip the entire grill instead of turning over each piece of meat. I’ve never used something like that before, and it really made things much more convenient. 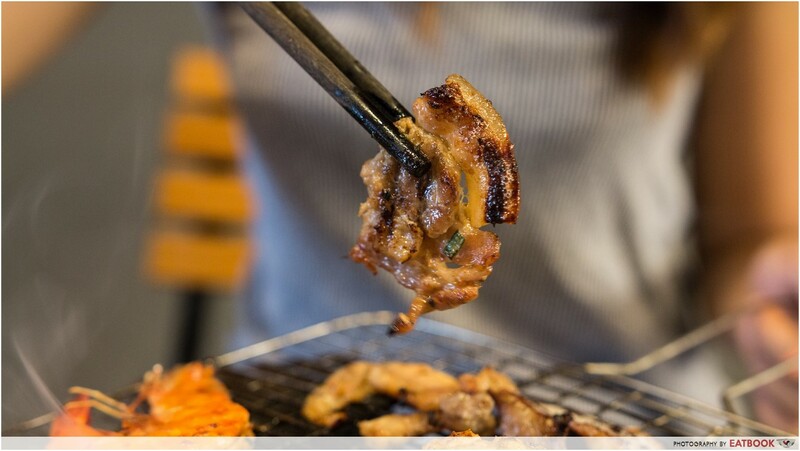 After all the wait, you’ll earn yourself a pile of smoky meat with some of its fats still sizzling. I prefer my meat a little more charred – something my mum would call me out for – but trust me, that ain’t burnt, that’s flavour. The pork belly slices and chicken were my favourites of the lot. The pork belly slice inhaled smokiness from the charcoal and the homemade marinate accentuated its natural flavour. It was so flavourful on its own I didn’t need any dipping sauce. The chicken, on the other hand, had a winning texture. It was a little charred and crispy on the surface, yet tender and juicy when you bite into it. 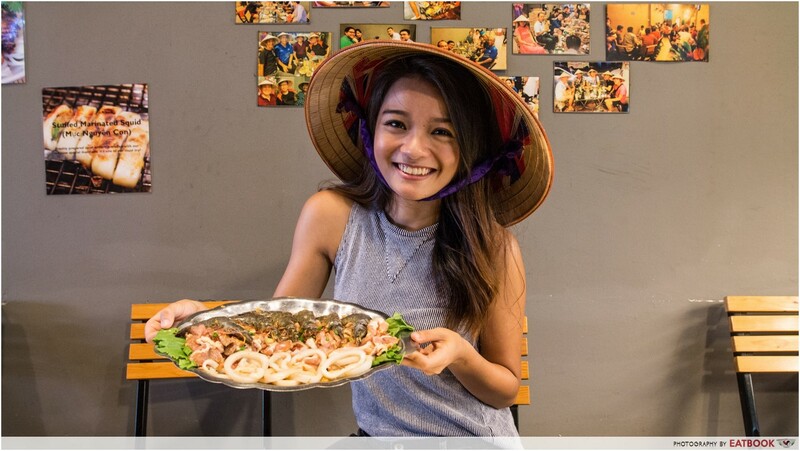 The prawns and squid weren’t as flavourful as the meat, but dipping them in Vietnamese sauces made up for it. On the left is chao mon, a thick orange sauce that was both sweet and sour and tasted like melted sour candy. In the middle is sambal oelek, which tasted like sweet Thai chilli. 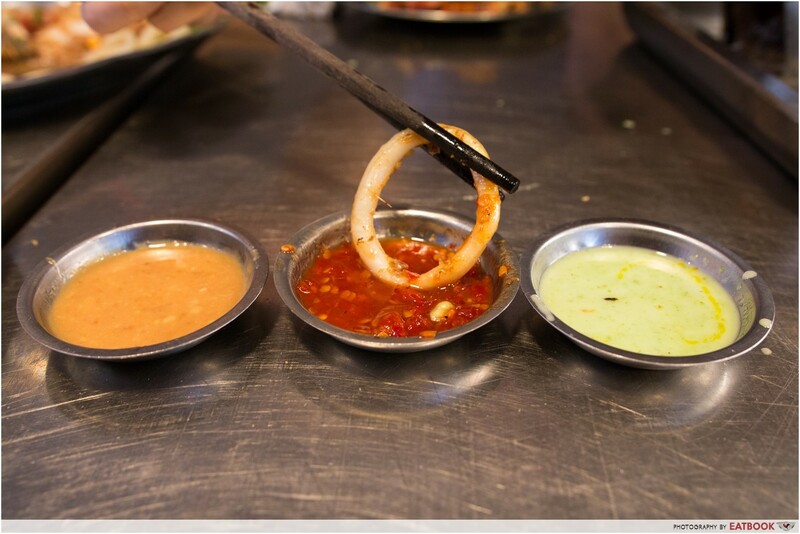 The last on the right is muoi chanh ot, or lemon chilli sauce. It turned out to be sweet, sour and refreshing rather than spicy. 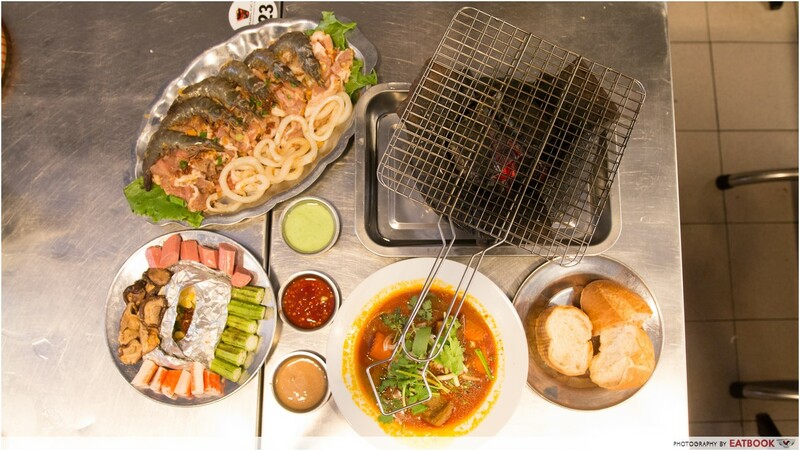 Besides BBQ, Lang Nuong also serves Vietnamese dishes. 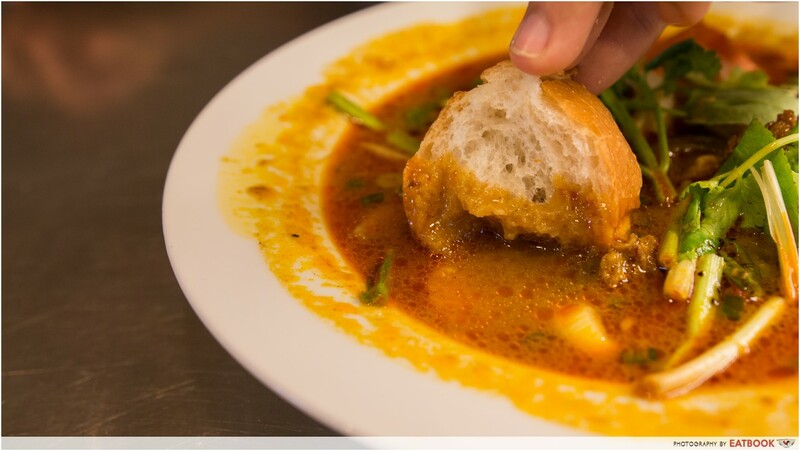 I had a taste of Bo Kho Banh Mi ($6.90+), which is beef stew with Vietnamese baguette. The beef stew arrived with a plate of warmly toasted baguette at the side. They were very generous with the amount of beef and I was surprised to find them in huge chunks! While many pieces were really succulent with fats that melt right in your mouth, there were some tough chunks in it as well. It would have been great if they used the same cut of beef to ensure a consistent texture. 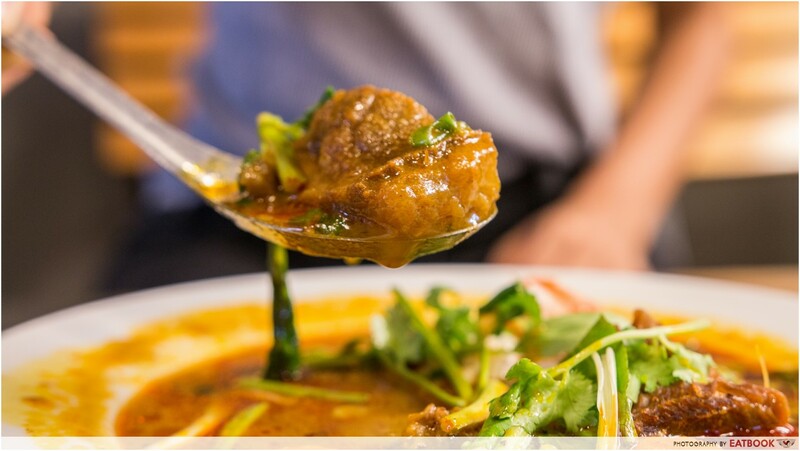 The stew looks diluted in comparison to thick and heavy Western beef stews, but its flavour wasn’t compromised at all. It had a really rustic and umami taste to it. The baguette was crisp on the outside yet soft and airy on the inside, making it the perfect weapon for soaking up all the goodness of the beef stew. 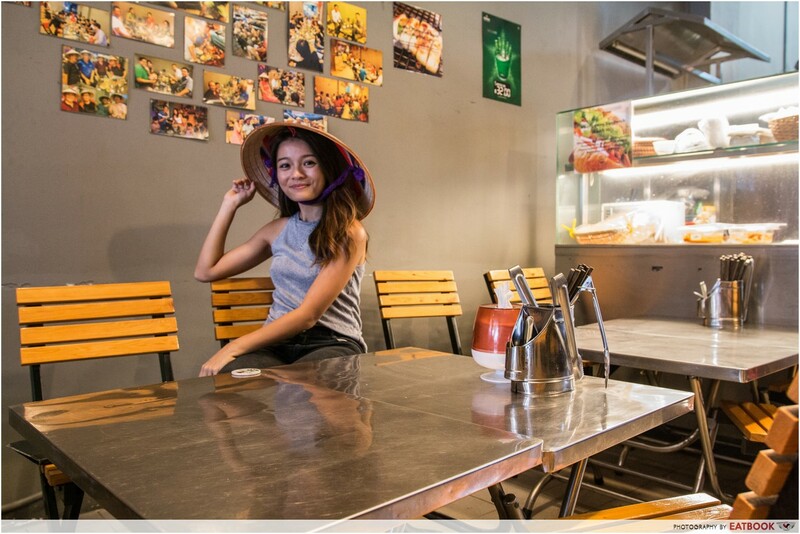 The seats and tables here resemble Vietnamese road-side stalls and that brought memories of when I was in Vietnam a few years ago. 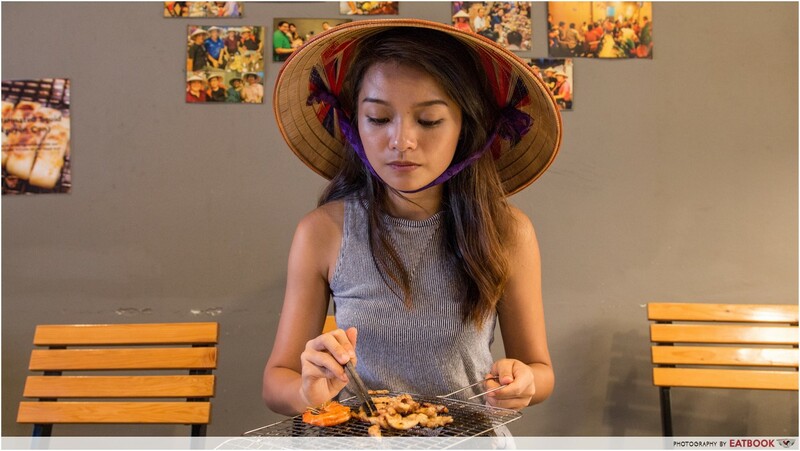 The owners’ effort in recreating the hustle and bustle of busy Vietnamese streets was on fleek. There were also straw hats lying around for customers to take photos in. I was immersed in the laid-back ambience the moment I sat down but at the same time was really pumped up about the food! 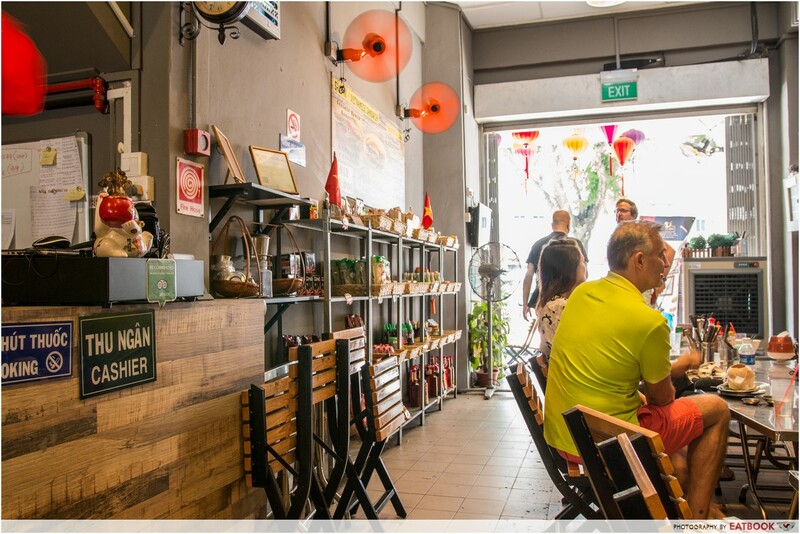 Another reason that makes this place a mini Vietnam in Singapore is they sell Vietnamese food products. 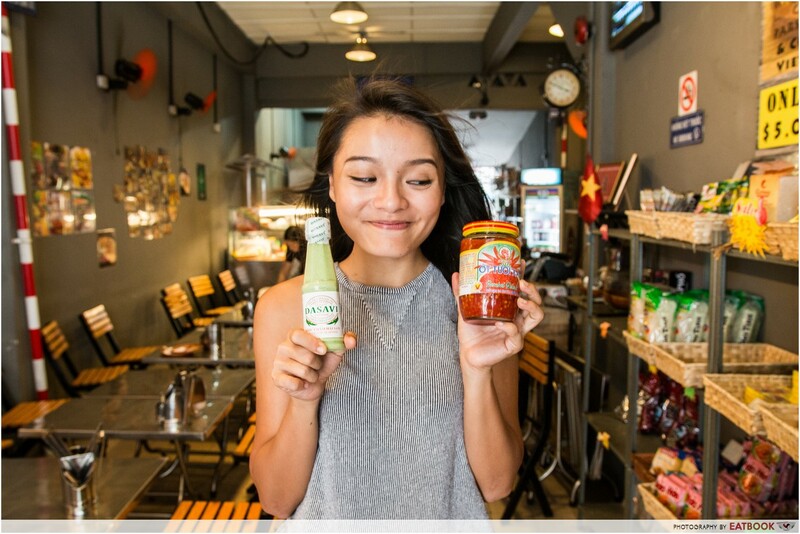 If you’re missing your days in Vietnam or you have fallen in love with their dipping sauces, feel free to grab a bottle before leaving. 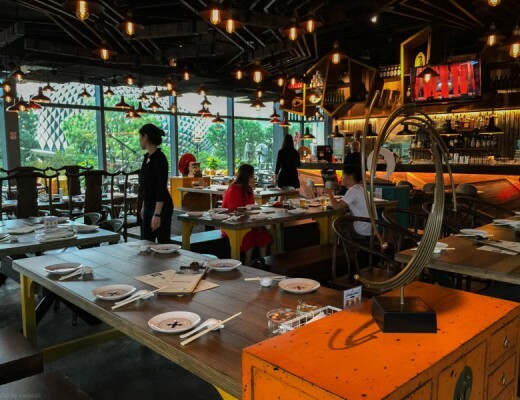 Grab your friends for a catch-up sesh here on weekends because the ambience is perfect for a chill-out night. My only gripe would be it can get a little smoky, but then again, it ain’t a barbecue without smoke. Make this your last stop unless you don’t mind smelling like a smokehouse for the rest of the day.